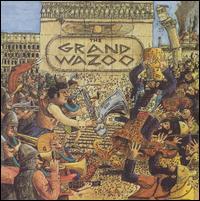 Like its immediate predecessor, Waka/Jawaka, The Grand Wazoo was a largely instrumental jazz fusion album recorded during Zappa's convalescence from injuries sustained after being pushed off a concert stage. While Zappa contributes some guitar solos and occasional vocals, the focus is more on his skills as a composer and arranger. Most of the five selections supposedly form a musical representation of a story told in the liner notes about two warring musical factions, but the bottom line is that overall, the compositions here are more memorably melodic and consistently engaging than Waka/Jawaka. The instrumentation is somewhat unique in the Zappa catalog as well, with the band more of a chamber jazz orchestra than a compact rock unit; over 20 musicians and vocalists contribute to the record. While Hot Rats is still the peak of Zappa's jazz-rock fusion efforts, The Grand Wazoo comes close, and it's essential for anyone interested in Zappa's instrumental works.